If one or more teeth are missing, there are a number of ways to replace them. 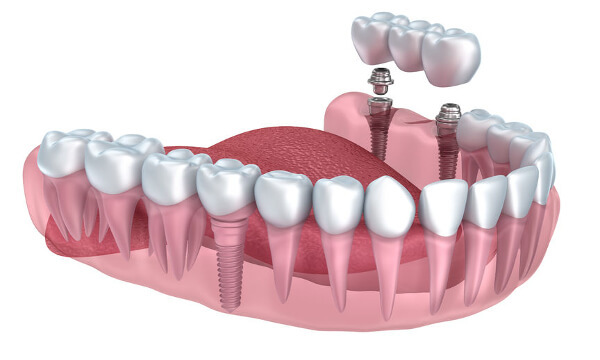 An alternative to tooth bridges, partial or full dentures, are dental implants . Implants are used to replace missing roots and to support artificial replacement teeth. Implants are comfortable and invisible just like natural roots. In modern aesthetic dentistry, implants are necessary in certain restorative dental applications. 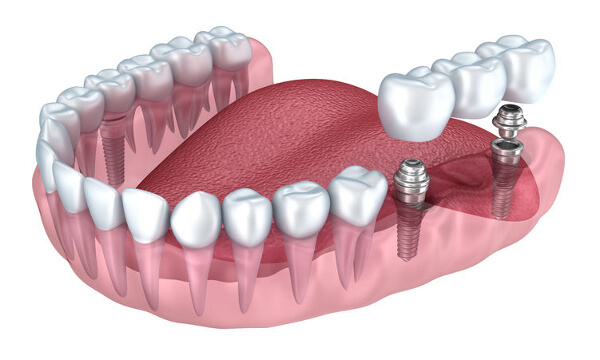 A dental implant is an artificial tooth root made of titanium metal. It is inserted into the jawbone to replace the root of the natural tooth. An artificial replacement tooth is attached to the implant. The implant serves as an anchor to hold the replacement tooth in place. If you are have good general health, your gum is healthy, your bone is strong and thick enough in the jaw to hold an implant, dental implants can be the right solution for you. If your jawbone has shrunk, or if it is not normally developed, you may be able to have a bone graft to build bones. A bone graft is a way to add a new bone in the jaw bone. Your dentist will tell you if a bone transplant or bone grafting is possible in your case. How dental implants are manufactured? Your implantologist will carefully examine your mouth and make radiographs of the head, jaw and teeth to find out if dental implants are suitable for you. During the first stage of the surgery, your dentist or specialist will place a dental implant in the jawbone under the gum. The gum is then sewn back to its place. While the tissue heals, the implant will bind with the bone and attach to the gum. It can take several months to heal. The second stage of surgery takes place 3 to 6 months after the first stage when the tissue is cured, your dentist in Hungary will attach a top to the implant. The top on the implant is an individually shaped extension post called abutmet, it connects the replacement tooth to the implant. In some cases, the first and second stages of the implant surgery can be performed one single stage. When dental technicians finished the artificial replacement tooth your dentist will attach it to the abutment. It may take several appointments to properly adjust the replacement tooth on the abutment. If multiple teeth or all your teeth are replaced, a solid bridge or PEEK tooth replacement is anchored to your dental implants. A dental bridge is a dental restoration that replaces one or more missing teeth by spanning the toothless area. The bridge is firmly held in place on each side of the missing teeth by dental implants. A dental implant is inserted into the jaw bone. Read more about tooth implants. Who is working with implants?